I guess you could sort of think of Autobianchi as Fiat’s cooler sibling who went to art school and always dressed way, way better than you. Autobianchi never really built all that many cars, either models or sheer volume, but what they did make was almost always striking, like this short-lived little charmer, the Stellina. Which seems to have an engine in a box, in the trunk. The Stellina was based on the popular Fiat 600D, and was designed to be a sporty counterpart to that reliable workhorse, much like the Karmann-Ghia was to the Volkswagen Beetle or the Renault Floride/Caravelle was to the Dauphine. Being based on the 600, the Stellina wasn’t exactly a beast, making only 29 horsepower from the 767cc straight-four engine, but it hardly weighed anything. The Stellina was only built between 1964 and 1965 because pretty soon Fiat themselves realized a little sporty version of their everyday cars made sense, and released the similar but slightly larger Fiat 850 Spider in 1965, effectively killing the Stellina. 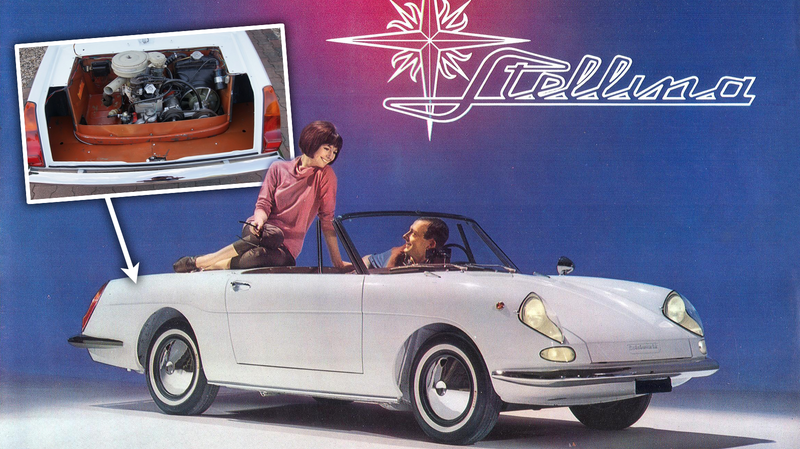 But, before that happened, the Stellina shone, and was the first production Italian car with a fiberglass body, something that was still pretty uncommon in 1964. The body design was really quite lovely, designed by Luigi Rapi, who may be best known for his earlier and adorable Autobianchi Bianchina design. The Stellina was elegant and sleek, qualities often difficult to pull off in a car this small. It wasn’t as overly cute as a car like this normally is, and managed to be more striking. It has some crisp flowing lines and sharp creases, and the lighting design is especially interesting, with the headlights having some dramatically-sloped clear covers with sharp creases, and even the indicators are deeply set under clear domes. It’s minimally ornamented, unfussy, and classy as all hell. A truly under-appreciated classic. Then, of course, is one of the weirdest engine compartments I’ve ever seen. The Stellina is rear-engined like the 600D, and as such has a small luggage compartment up front, though the Stellina’s is pretty dominated by that spare tire. In the rear, where most cars would have just stuck the engine, the Stellina strangely decides to box the engine in right there inside the rear compartment. Why, exactly? The surrounding U-shaped area isn’t really all that well suited to be an actual trunk, as stuff placed behind the engine to the rear of the car would still be in danger of getting filthy and mangled by the engine’s spinning pulleys, as well as blocking airflow from that fan to blow through the tiny radiator back there. Ohhhhh. It’s done that way because that weird U-shaped area is designed to hold one very specific thing: the convertible top’s tonneau cover! Now it mostly makes sense! I was almost going to include this in my Inspirational Trunks series, but I think this area is so specifically designed to store that one particular object that I really can’t think of it as a trunk, at least not in the usual general-purpose sense. But I do deeply respect the effort taken to carve out this useful little volume so the tonneau can be stored. It’s thoughtful and clever and it makes me like this charming little car even more.